Do High School Students Dream of Beautiful Architecture? Even though I am long past the age of attending high school, I occasionally drive out to South Pasadena just to look at this amazing example of a school evolving through time into what it is today – an architectural monument and a testament to the good sense to keep what is beautiful and impressive. In short, a piece of the past for present and future generations. 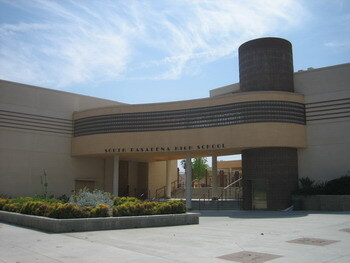 South Pasadena High School was build in 1906, with Art Deco additions in the 1920s, bungalows in the 1940s and tilt-up concrete buildings in the 1970s. In 2002 NTDStichler (Architects) finished the project of renovating and restoring the complex, while putting in some additions in perfect keeping with the Art Deco Style. Yes, it is a place where I would gladly go to school every day. With my mindset of today… it might be different if I were really of high school age.